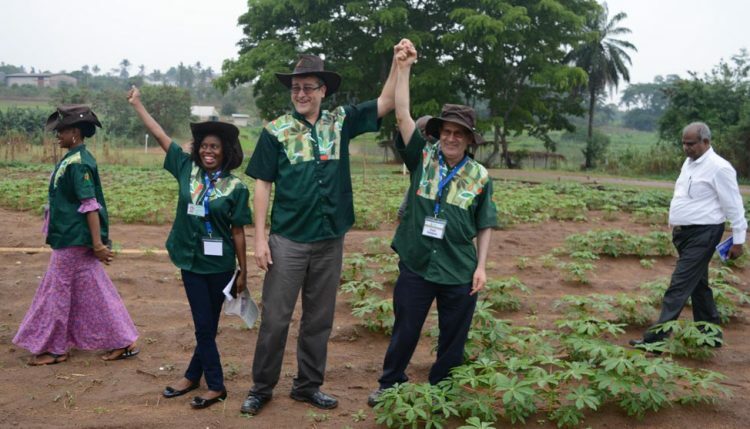 Nigerian seed sector professionals said that businesses selling improved varieties and high quality cassava stems for cultivation could help farmers significantly raise their productivity. The benefits of this raised productivity are expected to be enjoyed by all the stakeholders across the value chain in a sustainable way. Cassava stakeholders celebrating the project BASICS in developing sustainable seed systems in Nigeria. This came out during a national stakeholder conference on cassava seed system organized by the project “Building an Economically Sustainable Integrated Cassava Seed System” (BASICS) held at IITA, Ibadan, on 23 March. The meeting brought together national and international researchers, academics, policymakers, the private sector, nongovernmental organizations, and farmers to a roundtable to reflect on the experiences of BASICS in 2016 and refine the project plan for 2017 and beyond. 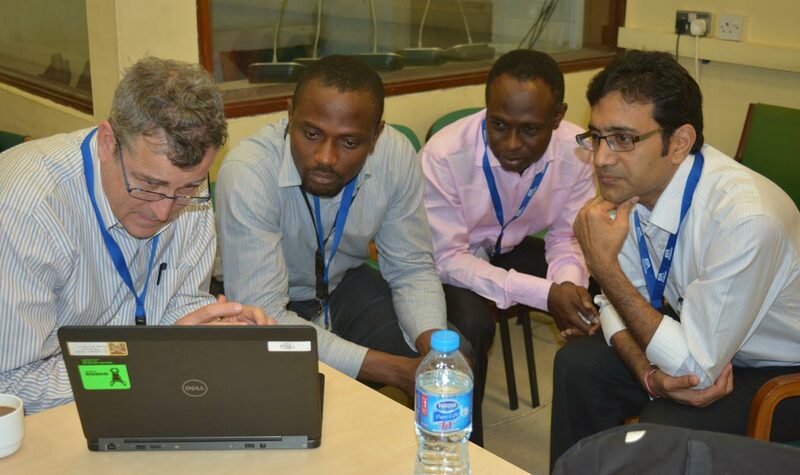 Hemant Nitturkar, Project Director for BASICS, made the case for the need for all stakeholders to work towards a sustainable seed system in Nigeria. He said that Nigeria is the largest producer of cassava in the world with a production of about 54 million tons, but its yield per hectare of roots is about 8 tons, less than half of the realizable yields of more than 20 tons. According to researchers, one of the causes of low yields in cassava is the poor adoption of clean and healthy seeds of improved varieties by farmers. “We have to start with the right planting material and nurture it with good agronomy and weed management practices. 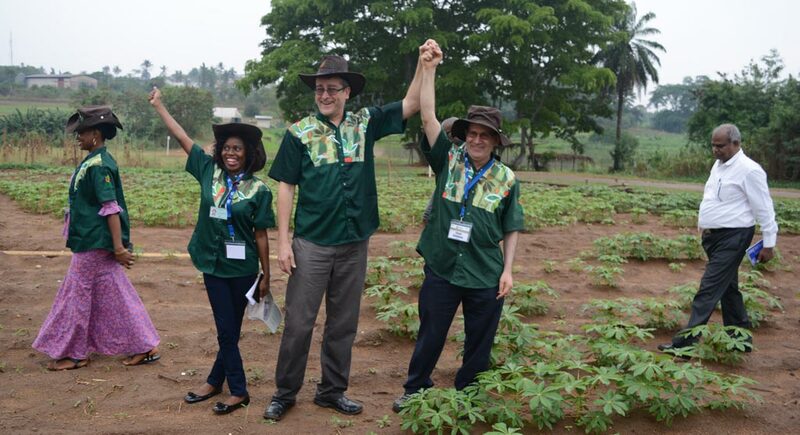 Each of these three components has the potential to raise the productivity of cassava by 30 percent. If we do not improve our practices in seed, weed and agronomy, we are incurring a lost opportunity of about 200 billion naira annually from each of the three issues,” Nitturkar explained. BASICS is commercially piloting two pathways of seed delivery. One is called Village Seed Entrepreneur (VSE), in partnership with Catholic Relief Services (CRS) in Benue and with National Roots Crop Research Institute (NRCRI), in Abia, Imo, Cross Rivers and Akwa Ibom states. Here, the project is helping develop a network of 130 community based seed enterprises. These VSEs will source certified stems of improved varieties from NRCRI and IITA to multiply and sell to the farmers in their vicinity. This way, the farmers will not have to go far to source quality stems for planting. The second pilot is called Processor Led Model (PLM), in partnership with Context Global Development. Here, the project works with large processors who then make available quality stems to their outgrowers with a buy-back arrangement for the roots produced. Slow and low multiplication ratio has been a key constraint in cassava seed system. The project is piloting a new technology called semi-autotrophic hydroponics (SAH) for rapid seed multiplication. Once this technology from Argentina is adapted and perfected, it is expected to have a significant impact on the ability of early generation seed businesses to quickly bring suitable varieties within reach of farmers. The project is also working with National Agricultural Seed Council (NASC) and Fera of UK to improve the quality certification system in Nigeria. Key BASICS project implementers in a huddle. Graham Thiele, Director of the CGIAR Research Program on Roots, Tubers and Bananas led by the International Potato Center (CIP); Alfred Dixon, IITA Director for Development and Delivery, and Project Leader for the Cassava Weed Management Project; Amin Babandi, Director of Agriculture, FMARD, represented by Segun Ayeni, Deputy Director, Roots and Tuber Crops, FMARD; Folusho Olaniyan OON, CEO, Contact Consulting Nigeria and Program Director, AgraInnovate West Africa; Emmanuel Okogbenin, Director of Technical Operations, AATF; and Robert Asiedu, Director R4D, IITA-West, all shared perspectives and added their voice to the call for stakeholders to jointly build a strong and sustainable seed system for cassava in Nigeria. This is a good one, and please adequate plan should be in place to reach farmers and educate them on the new improved variety… I’m passionate about farming and currently cultivating a 3hecters of land for cassava/corn production. Martin Edeme from Delta State. Hello Martin, thank you for your message. Yes, we are regular contact with the beneficiaries of new varieties and technologies. Can we assist you in anyway with cassava / corn farm? Thank you.